Dancing Attendees at the ASI Turkish Family Conference! 1st Annual Angling for Alström a Wonderful Success! Taking off the morning of the 1st Angling for Alstrom! If someone had told me 6 months ago how much work was involved in planning a fundraiser like the 1st Annual Angling for Alström, I’m not sure I would have stuck with the plan and made it to July 3. But WOW, I’m sure glad I did! The day began at 7am with the sun glistening on the water and 26 bass boats lining the shore of our cottage on Grand Falls Flowage. Registration took place on our front lawn and soon everyone was raring to go. Katelyn began the bass fishing tournament by announcing the order of the boats while sitting in the middle of the lake on her grandfather’s pontoon boat. What a great start to a great day! Once the tournament was underway, tables were set up, silent auction items were carefully placed and volunteers manned their posts as the day’s events began. Children registered for Kate’s Kids Angle for Alström, a fishing tournament for children under 16 and received an Angling for Alström tee-shirt designed by Adam Encrapera’s uncle, Rick Mullaney. Three pontoon boats were available for the children to ride to see who could catch the biggest or most fish. Trophies and medals were awarded for various fish caught, including the smallest fish. Throughout the day tickets were bought on several raffle items and bids were placed on silent auction items, all donated by local businesses, family and friends. A bake sale table housed many types of cookies, breads, rolls and cakes, which too was donated by family and friends. The kids had their faces painted, and a few adults as well, there were games to play and lots of people just relaxed by the water. Everyone seemed to be enjoying themselves. 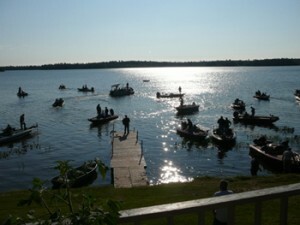 By mid-afternoon, the bass fishing tournament came to an end and the boats lined the shore of our camp once again. Each team arrived at the weigh station with bags of live bass waiting to be weighed. The total for each team was written on a score board for all to see and the atmosphere was pure excitement as everyone awaited to see who the winners would be. Cash prizes were awarded to the top 4 teams, as well as to the team with the largest fish. The day ended with everyone enjoying lots of food at the lakeside cookout. There were burgers, hot dogs, several different salads, corn on the cob, and lobsters, steamed to perfection on site. Dessert was a huge Angling for Alström cake. I don’t think anyone went away hungry and the site was awesome. I took this opportunity to thank everyone for their support and hard work, and looking at the crowd gathered around the tables enjoying themselves was a bit overwhelming. I couldn’t be happier with the love and support I felt at that moment. Organizing the 1st Annual Angling for Alström was a lot of hard work and long hours. I had lots of help from family and friends, including ASI’s own Phyllis, Tony, and Mike (and not to forget Jon, a new friend of the ASI family). Their help and support was much appreciated and I don’t know what I would have done without them. The day’s events raised over $3600…WOW! Next year’s Angling for Alström is already in the works. I learned a lot from this experience and can’t wait until next year. The 2nd Annual Angling for Alström will be bigger and better and I hope to see some of you there.